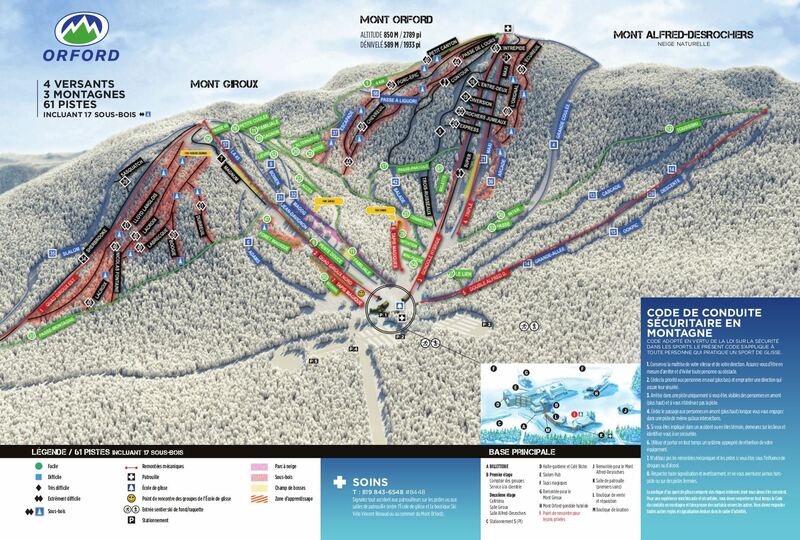 Mont Orford, the highest mountain of the "Big 4" of the Eastern Townships in terms of skiable vertical terrain, is located a little over an hour from Montréal, just minutes from Autoroute 10. A total of 44 trails and glades are waiting for you served by 8 lifts; 2 Quad chairlifts, a Triple chair, Double chair, a 6 seater/gondola hybrid, and 3 Magic Carpets. Orford consists of 3 summits, Mont Orford, Mont Alfred-Desrochers, and Mont Giroux. There are 2 faces on Mont Giroux, known as Giroux North and Giroux East. In the main chalet you will find the Groups and Client Services counter and seating area on the main floor. Upstairs on the second level is the cafeteria, and two halls, Salle Giroux and Salle Alfred-Desrochers. The daycare and Slalom Pub are also found here in the main chalet. Lift tickets are purchased at the windows outside. In the secondary chalet, the Boutique and Rental shop along with the ski school are located here. Lodging can be found at the base of Giroux East for guests staying over. Snowmaking covers 85% of the mountain. Summer at Orford, you will find hiking, and an 18 hole golf course. Shopping, lodging, and restaurants can be found in the nearby town Magog, 10 minutes away. With Orford having the highest vertical of the 4 main Eastern Townships resorts, it also has a wide variety of trails and glades to choose from. From the summit you have access to an easy trail named the 4km. This is a very nice long winding cruiser for the beginner, and makes for a great start to the day. Also from the summit you have the Grande Coulée, a superb intermediate cruiser that extends off the back side of the mountain looking out over Orford Lake and winds its way around back towards the east and ends at the bottom of the Maxi, a single black diamond trail and the bottom of the Triple chair known as the Rapido Triple. From here you would head down to the base of the main lift, The Hybrid, a 6 seater chair with a gondola cabin after every 3 chairs. The Trois-Ruisseaux is another popular trail leading from the summit that crosses the face of Mont Orford and heads down towards the base of the mountain. There are some challenging glades and some great steeps found here. Two of the three Magic Carpet lifts are found at the bottom of this sector. The Alfred-Desrochers area of the mountain is accessible by a double chairlift from the base of the mountain off to the right of the Hybrid lift. This section features mostly intermediate trails and a few easy trails on all natural snow. There is no snowmaking in this sector of the mountain. A few of the trails are groomed and some are left alone creating a good challenge. It's a great area to escape to if you like to ski a little "old school". The Mont Giroux area of the mountain offers 2 faces, East and North, both serviced by their own fixed grip Quad chair. Giroux North is accessed from the base of the mountain to the left of the chalet and Hybrid lift. There is an excellent choice of trails here from the beginner to the expert skier. The Jean-Davignon is an excellent intermediate trail along with some easy trails like the Famillale, la Pente Douce and Petit Coulée, and there is the Magnum, a single black diamond run, just to name a few. Giroux East is accessible from the summit by taking the Giroux North quad and at the top veer to your left and you will be on your way via the Slalom trail, a very nice intermediate cruiser. Under the quad is the Sherbrooke, a single black diamond run. There are some expert glades here, of which two bear the names of a couple well known Quebec skiers, Lloyd Langlois and Nicolas Fontaine. When you are ready to head back to the chalet, at the top of the Quad you can keep to your right and head down the Magnum, or to your left a choice of access to the Jean-Davignon or the Famillale for an easier way back to the chalet. One would find access to the lodging at the base of Giroux East. One of the unique features found here at Orford would be the Hybride chair/Gondola lift. For every 3 chairs on the lift line, you would find a Gondola cabin that would come in handy on those colder breezier days. Some may refer to this type of lift as a Chondola. The views from the summits of each sector are pretty amazing. At the top of Mont Orfordheading down the 4km trail, you would find a spectacular view of Owl's Head and Lake Memphremagog, and Jay Peak Vermont. From the Grande Coulée you can see the Lakeside trails at Bromont. The views of Mont Giroux North and East, and Alfred-Desrochers are pretty amazing as well. Last but not least, if one keeps an eagle eye open, you can still find remnants of the past. A few old cement tower bases of the old double chairs on Mont Orford, or on Giroux North leftovers of an old t-bar can be seen. If you are looking for easy or intermediate cruisers, challenging steeps, or glade skiing, all of these can be found at Orford. At the end of a long day, one can find an after ski drink at the bar in the chalet, restaurants to have something to eat, or a place to rest all nearby within minutes. With its proximity to the Autoroute, travel from the city to the mountain can be just a little over an hour away to spend a glorious day with the family.